Michael Several conducted extensive research on the public art of downtown Los Angeles. The result of this research, that included in-depth interviews with over 200 artists, art consultants, architects and arts administrators, was published in guides funded by grants from the Los Angeles Department of Cultural Affairs to the public art of El Pueblo Historic Park, Little Tokyo, and the Civic Center, an oral history of the public art of the MTA Gold Line from a grant from the California Council for the Humanities, and nearly 175 entries for the website publicartinla.com with a grant from the formerly existing Community Redevelopment Agency. In addition, he has had articles published in the Public Art Review. 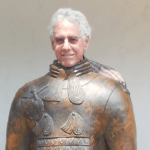 Michael has also led tours to public art in downtown, and successfully nominated for Historic-Cultural status the Spanish-American War monument, which is the first work of public art in the City of Los Angeles to receive this coveted status. In the early 1990’s, he was a key player in the successful effort to keep the traditional monuments in Pershing Square despite the lack of support by the Los Angeles Conservancy and against the initial opposition by the park’s architect, Ricardo Legorreta, the park’s landscape architect, Laurie Olin, the park’s developer McQuire-Thomas Partners, the Community Redevelopment Agency, the Los Angeles Department of Cultural Affairs.